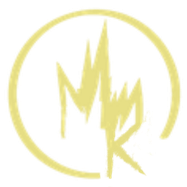 Flood Forecasting - michael-rinderers Webseite! Most human settlements are along streams and rivers. The values at risk have increased with the development of modern society and consequently also the risk of losses caused by floods. 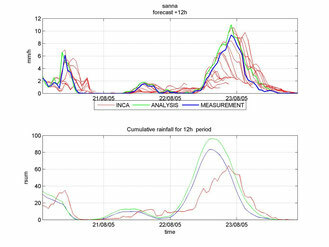 Flood forecasting provides valuable time to react. Up to now flood-warning in Tyrol has been based on the experience of hydrologists interpreting the latest rainfall- and discharge measurements in the headwaters of the river Inn. 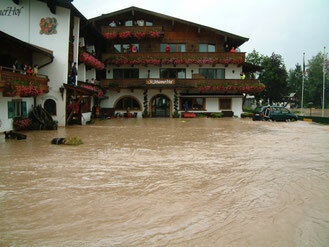 To extend the lead time alpS and partners from the private sector and the local authority have developed an operational flood-warning-system in order to predict runoff and water-level along the river Inn in Tyrol. The system consists of a joint hydrological-hydraulic modeling framework which in case of a flood event calculates a flood-prediction-scenario every hour for the next 48 hours. The system has access to 70 online meteorological weather stations and the latest weather predictions gained by the official Austrian Central Institute for Meteorology and Geodynamics (ZAMG). The 50 contributing catchments of the river Inn are simulated with a water balance model covering all relevant processes of the water cycle. As parts of individual catchments are covered with glaciers, an energy-balance model simulates the snow- and ice melt within the modeling framework. For the prediction of the runoff and the water-level along the river Inn a hydraulic model is used which is able to simulate the management of existing hydropower plants. The flood-forecasting system “HOPI” has been in operation since 2009 and is still subject to further improvement in the course of an ongoing alps-project in collaboration with the Hydrographical Division of the Regional Government of Tyrol.